This hotel in central Munich offers quiet rooms and good transport links. The train station and Oktoberfest site are about 5 minutes away on foot. The Hotel Andra München was fully renovated in late 2009. It offers colourful rooms with flat-screen TVs and modern bathrooms. Wi-Fi is available in all areas of the Andra for an extra fee. The Hotel Andra's serves a rich breakfast buffet. Dining is also possible on the sunny terrace. 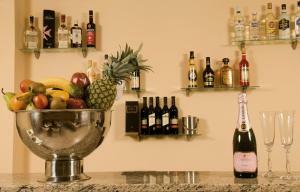 Beverages are available in each room, a mobile minibar is available on request. The Goetheplatz and Hauptbahnhof underground stations are about 5 minutes away on foot. They connect you to the Messe exhibition centre and Allianz Arena stadium or Olympiapark stadium in 20 minutes.